They were ordinary farmers, laborers, merchants, tradesmen, slaves, and former slaves, the cross-section of a typical eighteenth-century New England farming community. But when faced with the loss of their cherished liberties and long-standing tradition of self-government, they were swept up in an epic struggle against long odds. These are the forgotten men who fought the American Revolution. Meticulously researched, Embattled Farmers traces the footsteps of 256 men—all from the same town—who served on both sides of the war. Their stories bring to life the human dimensions of American’s War for Independence. Through repeated enlistments, 252 of them served as Patriot soldiers. They served at Lexington and Concord, at the Siege of Boston, and during the campaigns to Ticonderoga, Canada, New York, Saratoga, the Hudson Valley, The Jerseys, Valley Forge, and Yorktown. Some never made it home again. neighbors and kinfolk. They lost everything they had, and lived the remainder of their lives in exile. Despite family and community ties, four others remained loyal to the King, and fought against their neighbors and kinfolk. They lost everything they had, and lived the remainder of their lives in exile. There was nothing extraordinary about these men. Their individual stories tell of under-age service, skirmishes and battles, guard duty, fatigue duty, capture by the enemy, smallpox, desertion, and hardships, as well as service by slaves, economic dislocation, and the practice of substitution. Collectively, their stories present a fascinating mosaic of a community at war. 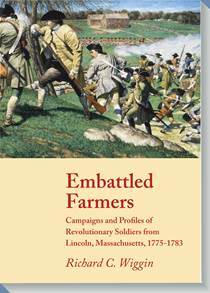 Told mostly from the perspective—and in some cases the actual words—of the men themselves, Embattled Farmers places the reader shoulder to shoulder with the men-at-arms. As minute men, as militia men, privateers, Continental soldiers—and Loyalist militia men—as officers and foot-soldiers, the stories of these men provide a human perspective to America’s Revolutionary War. The book’s many hidden pearls will delight any armchair historian.